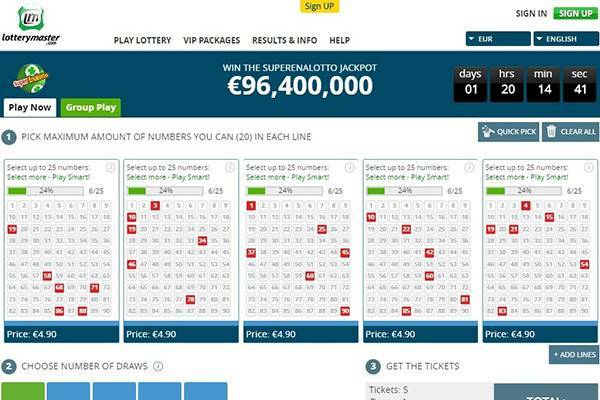 LotteryMaster is a good example of a straightforward online lottery website, which simply offers a purchase of a ticket without any special or out of the ordinary features and bonuses. There are mixed comments on the site online so reaching a solid conclusion that the site is worth a try is a pretty tuff task. Trying to find the facts behind the establishment of the site (launch date etc.) doesn’t add to the overall impression. 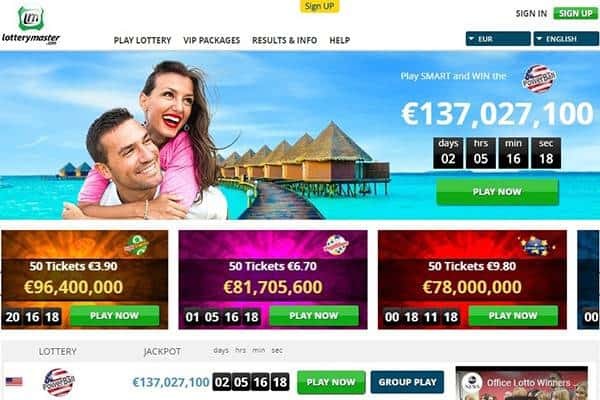 There are plenty of online lottery websites we can recommend instead of taking risks using LotteryMaster services, all of those websites are shown on our homepage. Does LotteryMaster meet today’s web security standards? 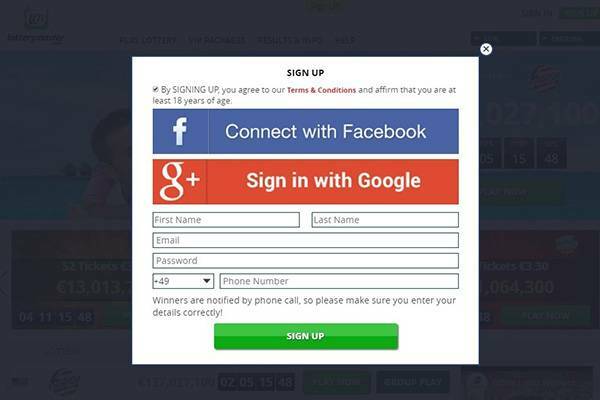 What efforts LotteryMaster makes to protect its player’s private details and information? What products does LotteryMaster have on its “shelf” for players to pick from? How well do they perform? What features does LotteryMaster offer its players? How do they contribute the overall user’s experience? How does LotteryMaster’s experience carry across the many screen sizes and platforms it’s players are migrating between throughout the day? What incentives does LotteryMaster offer it’s new and existing players? Purchase bonuses, bring-a-friend, loyalty program, and VIP points. How can a player get hold of LotteryMaster in case of something going wrong? What are LotteryMaster’s response time and availability? Since online lottery purchase involves giving personal and payment details, this review aspect is of the highest importance, and should be a deal breaker for any potential online lottery player. It measures the relevancy of tools and services LotteryMaster makes use of in order to keep all data transactions between the player’s computer or mobile device and its servers. Failure to pass this test makes all other review aspects irrelevant. It is a sign of trustworthiness and good intent. LotteryMaster has a valid SSL certificate by DigiCert, this means the connection between its players browser and its servers is encrypted. This encryption protects both sides from having their data stolen and misused. Visitors to the site can instantly see it is secured as there’s a green lock icon to the left of the site’s URL. Important to mention the certificate is set for LotteryYard which is the platform behind LotteryMaster website. LotteryMaster adds more security layers and approval for their security level through McAfee SiteAdvisor and Norton’s Safe Web – all of the above shows LotteryMaster is taking seriously the expected level of security the online lottery customer look in an operator. There are numerous companies that track sites for any suspicious or potentially mischief behaviors and practices. For this review most known and a few less known were taken to account. Google Safebrowsing approved – Google daily review pages by the billions for potential hazards. LotteryMaster’s domain was found not dangerous. Norton Safe Web – Symantec’s service found 0 threats with LotteryMaster. SiteAdvisor – McAfee’s service didn’t find any significant security issues and set its status to safe. Other services LotteryMaster was cleared on: Phish Tank, SpamHaus, BitDefender, Sophos, ESET. A lottery line just as a lottery player would buy at a local kiosk. This is the starting point for all operators, it is the basic service and product – all other services and products are based on this standard line. A player can manually pick the line’s numbers or automatically Easy-Pick it. It’s important to state LotteryMaster not allowing the customers to pick just 1 line rather and automatically “force” you to pick more (3 lines). We spot here a big downside that simply can’t allow new customers to test the service with minimal cost as possible. This feature allows you to improve your odds in winning the big prize by covering more number combinations, the more shares you buy the bigger your cut will be in the prize if you win. 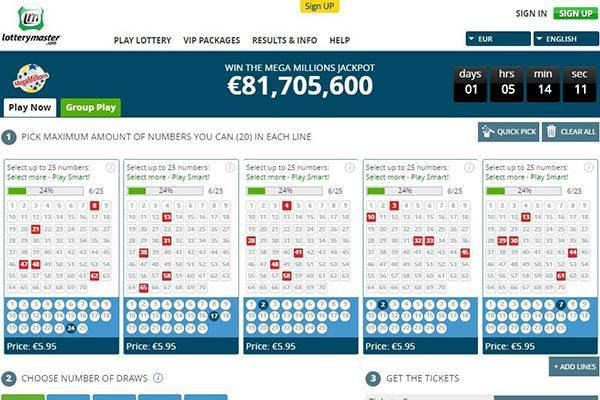 Auto fill all incomplete lottery lines with one click of a button. Not many players take the time and manually pick more than a couple of lines – It’s redundant. LotteryMaster ticket page has several buttons to open multiple empty lines (up to 5 lines) and the quick pick auto fills all those who are clear. A player can potentially quick pick 5 lottery lines with just two clicks. With a very limited features list, LotteryMaster scores a medium score on this operator aspect. The absence of key features like choosing multiplier for the top American lotteries are placing LotteryMaster in a solid place but not to stand out among other operators. Site’s width is full screen which enables LotteryMaster to cram many elements on first glance. Design is clear and easy to navigate and get around. There are not visible bugs we can spot while scanning this site beside minor glitches on the checkout screen. 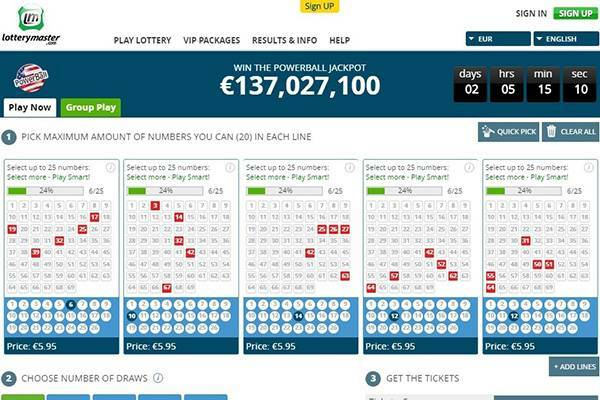 LotteryMaster is well adapted to mobile as expected from a LottoYard product. The lottery draws as well as the checkout funnel runs smoothly on smaller screens. Overall graphics and design could and should be better but the basics are checked here with confidence. Promotions are one of the tools marketing and customer relations have to reward player for engaging with LotteryMaster. They are used for acquisition of new players, retention of existing, or reactivation dormant. LotteryMaster are granting you a 100% bonus money on the first purchase you make, this bonus money will assist you in participating future draws. LotteryMaster are rewarding your loyalty by granting various discounts on future draws. Each €1 spent = 1 FPP VIP Point. The more you play the less you will pay! Bronze Level (1000-8999FPP Points) – Enjoy 50% Cash Back on your purchase. Silver Level (9000-29999 FPPPoints) – Enjoy 5% Cash Back in Bonus Money + 1% additional discount on your purchase. Gold Level (30000-99999 FPPPoints) – Enjoy 50% Cash Back in Bonus Money + 1% additional discount on your purchase. Platinum Level (100000+ FPPPoints) – Enjoy 10% Cash Back in Bonus Money + 2% additional discount on your purchase. Promotions are straight forward and cross industry. All operators use the same offers to attract players, just different rates. What should be an interesting review aspect is a completely generic one, and Lotto Agent has no excuse. As it is using it’s own platform, there really is no reason why they shouldn’t bring some news and be among industry leaders. There’s usually very little use of customer support, especially in comparison to other review elements. But a lottery player need to know there someone on the other end of a line that can assist in real time, or as close to real time as possible. A customer support representative is available on live chat. Important to mention chat services are not always available, possibly due to the fact no agent is available to take the call. Phone support is included 24/7 and supported in various languages: AU, SA, UK and NZ. Given the problematic findings are shown in the security section, the basic offering and above all the lack of option to purchase a sole ticket puts LotteryMaster at the bottom of our ranking tables. 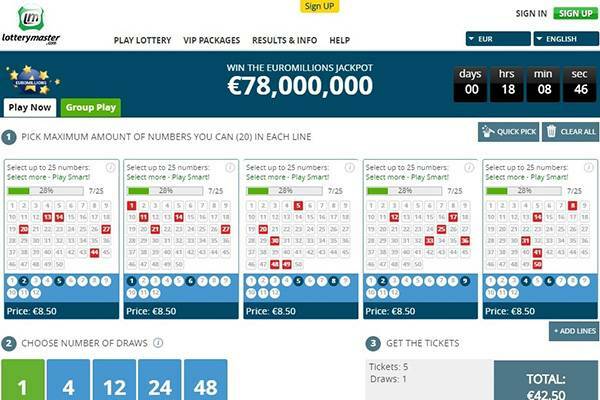 If you were going to place a purchase through the site, think again and take a smarter pick using our approved and trusted lottery operators.